A managers retreat has become a yearly tradition for United Group, and it’s proven a valuable opportunity to bring the company’s property managers together to learn new leadership skills, discuss goals and expectations, and understand new system updates and features. The 2018 Managers Retreat kicked off with a team dinner and fantastic magic show on Wednesday night, and the United Group Team was up bright and early on Thursday to welcome experts from the Mahoney Performance Institute. They explored ways to help managers become better leaders and help employees reach their highest potential. Yardi representatives were also welcomed to the Managers Retreat to discuss new system updates and ways to utilizes different tools. Following the seminars, the entire team boarded The Morgan, a replica of a 19th-centuary touring vessel that offered an unforgettable experience on Lake George thanks to optimal weather, a scenic sunset, a fantastic meal, and great company. After dinner, Chief Operating Officer Jeff Arnold began the award ceremony. Each year, United Group likes to recognize members of the team who go above and beyond their call of duty, and were proud to award Property Manager Of The Year to Shannon Redden, the President’s Award to Mary Christman, and the Success Model Award to Chris Wiltey. Shannon, Mary, and Chris work hard, they’re resilient, and they never back down from a new challenge. United Group appreciates the effort, leadership and passion they demonstrated this year. They were immediately congratulated by Vice President of Human Resources Joan Cavanaugh, President & CEO Michael Uccellini, Chief Operating Officer Jeff Arnold, and Regional Managers Mike DiGiacomo and Jackie Shafer. Following the award ceremony, United Group recognized the latest United University graduates Max Jones and Samantha Marchesin for earning their Bachelor’s Degree, and Erin McKee, Mary Christman, Beatriz Beecher and Emilis Lewis for earning their Associate’s Degree. The new United University graduates were handed their diplomas by their respective Regional Managers and Human Resources Manager Michaela Gabriele. United University is the company’s management training program that is designed to provide exceptional training and tools to motivate, promote and support employee development. The program was recently a finalist for an Institute of Real Estate Management REME Award. On Friday, United Group’s accountants traveled to Lake George from the corporate office to join the excitement. The United Group was given full reign of the Sagamore Resort’s indoor activity center, which features a basketball court, wiffleball field, ping pong tables, miniature golf course and billiards tables. 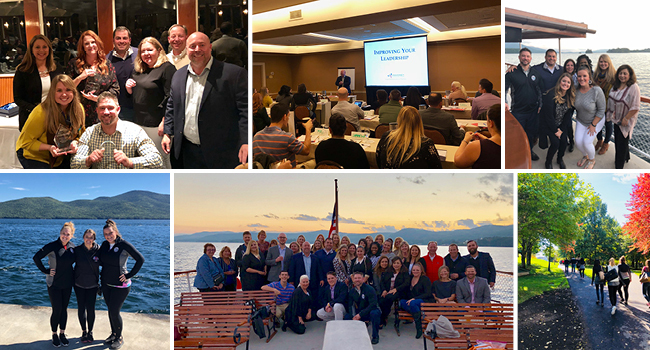 The day’s activities concluded with a team lunch overlooking beautiful Lake George, and the 2018 Managers Retreat came to a close. Another successful Managers Retreat is officially in the books!